Forum Index > Off-topic Talk > What type of Sword is this???!! 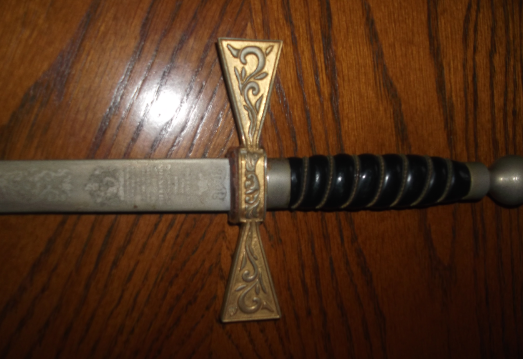 Posted: Sat 16 Mar, 2013 7:31 am Post subject: What type of Sword is this???!! Hi there, we have had a sword hanging in our living room (was in our attic for some time), but we are now looking to shift it on as we are moving house. We have no idea what it was used for (probably ceremonial) or the value of the sword, also we are unsure if you can sell swords or have to under specialist auctions? I have enclosed picture attachments and the description of the writing on the sword blade. Has an etched design down blade with knight, lion and other designs; blade is blunted. Ceremonial? Gold gilded cross handle, blacked enamelled spiral handle & brass/metal end, no sheath. Certainly ceremonial. Not my specialty but looks like a 'lodge' or society sword. can't see anything masonic on it but that's what I'd say. Others on here far more knowledgeable will say. Thanks! Hopefully I'll know what it's worth to shift it on as it is out of place! It is a British Masonic sword. Not sure of the value.